Be warned. This piece has been written by a Beatles-nerd. Europeans did not understand the point of the U.S. Beatles albums. The track listings were strange, they had strange titles (and sleeves), but the strangest thing of all was how they sounded. The recordings (especially on the first couple of albums) were somehow blown up. The record company had put reverb on it, everything sounded bigger, but with a tamer punch. That some tracks appeared in fake stereo was another peculiarity. Capitol called it duophonic: cutting the bass frequencies in one channel with a high-pass filter, then cutting the treble. frequencies in the other channel with a low-pass filter, a slight delay between the channels, maybe some extra reverb, this combination would hopefully fool the listener into thinking it was a stereo-recording. On many occasions the mono LP’s sounded different too. If you listened closely these were not the same mono mixes that you knew so well from the British albums. Why? Capitol did not always use the British mono masters, but rather made their own using the fold-down trick, transferring the music into a two-to-one stereo-to-mono mixdown. Doing this they actually created mono-versions unique to the US albums as the Beatles and George Martin took great care in mixing the mono and stereo-editions of each album separately, sometimes even using completely different takes. FWhen we got older our views on the American albums softened. They were in no way better than the British originals, but they provided a different listening experience, and that was… well, quite OK. Fascinating, actually. We grew up with the British track listings, they were carved in stone. We knew instinctively what track would follow the next when we put the albums on. That is why the American variants gave us such refreshing surprises, they sharpened our attention, this was familiar stuff, but from an unexpected angle. The unfamiliar succession of the tracks was one thing, but even more important was the fact that the music sounded different too because Capitol – as mentioned – had tampered with the mixes. This was fun, it made the U.S. albums unique, they were a contribution to the wonderful existence of being a Beatles-fan. When The Beatles entered the CD-era in 1987, the Americans were in shock. They were forced to deal with the British albums. The U.S. albums were gone, as if they had never existed. Someone stomped on their childhood and poked their adolescent years with a sharp stick. It had all been a fraud. It hurt. Finally, in 2004, after listening to the American moaning and convulsive weeping for 17 long years, Apple finally caved in and released the first four Capitol albums in a CD box. The CD’s contained both the mono and stereo mixes and were packaged in miniature replicas of the original LP sleeves (“The Capitol Albums Vol. 1”). “The Capitol Albums Vol. 2”, containing the next four albums, followed in 2006. But that was the end of it. Maybe the negative vibes both from fans and critics got to Capitol. The first set was criticized because it omitted the “A Hard Day’s Night” (originally released by United Artists, and technically not a Capitol album) and “The Beatles’ Story” (strictly a documentary album). And the design of the box itself was of course plain silly. The second set was in for a rougher ride. What happened to the gorgeous gatefold “Help!”-sleeve? They reduced it to a single cover, now what kind of cheapo replica was that? And what happened to the original mono mixes of “Beatles VI” and “Rubber Soul”? They’d been replaced with newly made fold-downs of the stereo-mixes, that’s what. Apple/Capitol were rewriting history. And the target audience wasn’t happy. The irony is that by creating these new mono-mixes Apple/Capitol turned “The Capitol Albums Vol. 2” into a unique set, a must have for collectors. The collectors didn’t like that. Nobody did. Eight years later and Apple/Capitol are at it again. “The Beatles , The U.S. Albums” is an (almost) complete journey through all the American albums that was different from the British (with the omission of “Magical Mystery Tour “, which in 1976 was accepted as an official LP and thus incorporated into the official British discography, and with the exception of the Vee Jay-version(s) of “Please Please Me”). 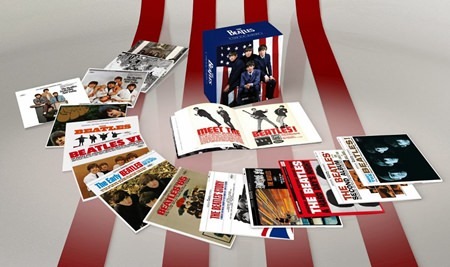 The box also includes the albums that were not in the 2004 and 2006 boxes: “A Hard Day ‘s Night”, “The Beatles Story”, “Yesterday And Today”, “Revolver ” and “Hey Jude” (a 1970 compilation). The albums are housed in an elegant looking box (a huge improvement on the shabby boxes that were used in 2004 and 2006), while the glossy 64 page booklet contains an essay on the American albums and some nice photos. The best thing about the box is the album sleeves, beautifully reproduced replicas of the originals (and yes, this time “Help!” comes in its gatefold) with the original inner sleeves to boot. And if you are offended by the butcher-cover of “Yesterday And Today”, the trunk-cover is included as a sticker, so you can make your own paste over-version. Apple/Capitol have thus done their homework. The sleeves and the box design are as beautiful as anything the masters of replicas, the Japanese, could’ve come up with. But there is one objection to this thing, and it is significant: The music has not been remastered from the original Capitol 60’s tapes; with few exceptions they have rather used the British 2009 remasters. In other words: The whole point of a box like this is gone. You don’t get the unique American audio experience, you get the same stuff that you probably bought in 2009, only in different sleeves and the tracks presented in different successions. Of course, if your definition of happiness is to thumb through perfect cardboard miniature replicas of the old LP sleeves, this box is for you. The rest of us do not fall for the record company’s explanation, that they wanted to give us the best possible sound quality and therefore excluded the inferior Capitol tapes and went for the superb 2009 remasters. That is such bull. If the point had been to buy The Beatles for the sound quality, why would we need this U.S. box at all, the British boxes are already there, both in mono and stereo. Non-American Beatles fans want the tinkered with inferior but oh so fascinating US-mixes because they are different, I’d even say exotic. And for the Americans, they want it as it was, they want their childhood back. Sod the best possible sound quality. We know the American albums were inferior, we don’t care, we like it like that, they were different! Gone is the overwhelming reverb that made “The Beatles ‘ Second Album” such an awesome and exciting happening. Gone are the quirky fake stereo solutions that turned songs like “She Loves You”, “I Feel Fine” and “She ‘s A Woman” into flabbergasting surprises. Yes, basically the whole point is gone. The record company does try to sugar the pill by claiming that they have cheated a little by tampering slightly with the 2009 remasters to make them sound a bit like the Capitol originals. That is hard to detect, even when playing these CDs alongside the British 2009 versions. OK, so they have included the long mono version of “I’ll Cry Instead” (from the U.S. “A Hard Day’s Night”) and we get the stereo mix of “I’m Looking Through You” with the false start. These are just alms in a sea of misery. The only thing this box accomplishes is increasing the need for the original vinyl releases. Fortunately they are all still readily available on eBay. “Meet The Beatles” – released in January 1964: “I Want To Hold Your Hand” and “This Boy” was not mixed in stereo in England at the time, so they appear in DUOPHONIC stereo, i.e. enhanced treble in one channel, enhanced bass in the other, and a small delay between the channels to provide additional depth. “I Saw Her Standing There” was remixed in stereo for the American album. The content is derived from “With The Beatles” (9 tracks), “Please Please Me” (1 track) plus both sides of the British “I Want To Hold Your Hand”-single. “The Beatles ‘ Second Album” – released in April 1964: Reverb galore. Perhaps the most successful of all the American albums. The stereo version of “Thank You Girl” is unique to this release. The fold -down technique was used on the stereo recordings of “Thank You Girl” and “Money”, so these mono versions are unique and differ from the British releases. “Long Tall Sally” has lots of echo in stereo but not in mono, the mono and stereo versions of “I Call Your Name” are different, and the mono mix of “You Can’t Do That” is not identical to the mix on the British “A Hard Day ‘s Night”-album. The content is derived from “With The Beatles” (5 songs), the “Long Tall Sally”-EP (2 songs) plus both sides of the “She Loves You” single and two B-sides, “Thank You Girl” and “You Can’t Do That “. “A Hard Day’s Night” – released in June 1964: All eight Beatles recordings on the stereo version are duophonic , i.e. in fake stereo. “I’ll Cry Instead” is the extended version (achieved by repeating the first verse). Content is taken from “A Hard Day ‘s Night” (8 songs). Remaining tracks are four instrumentals performed by the George Martin Orchestra (including Ringo’s theme “This Boy”). “Something New” – released in July 1964: The five songs that are also on the U.S. “A Hard Day ‘s Night” are presented in the same mono mixes. “When I Get Home” and “Any Time At All” are alternate mono mixes and not identical to the British. Paul’s voice is not double tracked in the mono version of “And I Love Her”. Content is taken from “A Hard Day ‘s Night” (8 songs), the “Long Tall Sally”-EP (2 songs), plus the German single A-side “Komm, Gib Mir Deine Hand”. “The Beatles’ Story” – released in November 1964: Documentary album containing voice-overs, clips from interviews and press conferences, short snippets of songs – including a few seconds from the Hollywood Bowl version of “Twist And Shout” and also a clumsy edited “Beatles Medley” which is only available on this album. Nothing on this album was ever released in Britain. “Beatles ’65” – released in December 1964: Duophonic versions of “I Feel Fine” and “She ‘s A Woman” – with added reverb. Added reverb also on the mono versions of these. The stereo mix of “Mr. Moonlight” has a longer fade-out than the mono mix. The content is derived from “Beatles For Sale” (8 songs), “A Hard Day’s Night” (1 song) and both sides of the “I Feel Fine”-single. “The Early Beatles” – released in March 1965: Capitol’s stripped down version of “Please Please Me”, only 11 tracks. The mono version is a fold-down and not the unique British mono mixes. “Love Me Do” and “P.S. I Love You” are duophonic on the stereo album. Some echo and reverb added to “Twist And Shout”. The content is derived from “Please Please Me” (all 11 songs). “Beatles VI” – released in June 1965: Duophonic version of “Yes It Is” with added echo and reverb. The content is derived from “Beatles For Sale” (6 songs), “Help!” (3 songs), plus the B-side “Yes It Is” and “Bad Boy”, which was recorded exclusively for this album. “Help!” – released in August 1965: The title track opens with a short orchestral introduction of the James Bond-theme making this version of the song “Help!” unique. Mono version of the album is a fold-down of the stereo version. Oddly enough this also applies to “Ticket To Ride” which was duophonic on the stereo album. Why a fold-down of the duophonic version when they already had the true mono mix, “Ticket To Ride” having been released as a single a few months earlier? Although the album contains only 7 Beatles recordings (all from “Help!”), it is nevertheless interesting because of the instrumental music provided by Ken Thorne. Two of the tracks feature Indian instruments and melodic flavors. So this is where the sitar appears on a Beatles LP for the first time. “Rubber Soul” – released in December 1965: The stereo version is interesting for “I’m Looking Through You” with its false start and for “The Word” which is a completely different mix from the British version with some extra overdubs. The mono version of “Michelle” is a slightly different mix and has a longer fade-out than the British original. The content is derived from “Rubber Soul ” (10 songs) and “Help!” (2 songs). 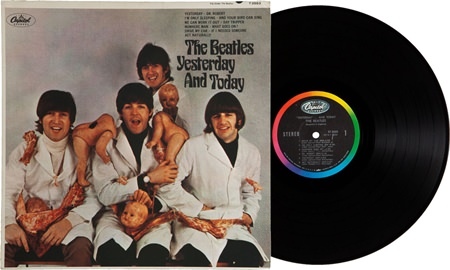 “Yesterday And Today” – released in June 1966: The first pressings came with duophonic mixes of “I’m Only Sleeping”, “Doctor Robert” and “And Your Bird Can Sing”. Quickly replaced with proper stereo versions, but both “I’m Only Sleeping” and “Doctor Robert” appear in radically different mixes from the ones found on the British “Revolver”. The content is derived from “Help!” (2 songs), “Rubber Soul” (4 songs), “Revolver” (3 songs), plus the single “We Can Work It Out”/”Day Tripper”. “Revolver” – released in August 1966: The content is derived from “Revolver” (11 songs). The album loses three songs from the British original, none of them replaced with anything else, the mixes are identical; in other words this is a completely pointless LP, both on vinyl and CD. “Hey Jude” (aka “The Beatles Again”) – released in February 1970: Stereo image of “Hey Jude” and “Paperback Writer” is turned, if I remember correctly. This album exists only in stereo. The content consists of 5 single A-sides and 5 single B-sides from the years 1964-1969, none of which had been included on any U.S. Capitol/Apple-album. The album was a stop gap-release between “Abbey Road” and “Let It Be” and reached no. 2 on the Billboard charts.